Mary Kathryn (Gratz) Carrier, 91, of Sandusky passed away Thursday, August 9, 2018 surrounded by her family. She was born July 26, 1927 near Rockport, Ohio in Allen County and was a 1945 graduate of Columbus Grove High School. Prior to her marriage, Mary was employed as the clerk of Bluffton Schools in Bluffton, Ohio. After moving to Sandusky and raising a family, she was employed at the former Asher Brothers Auto Parts where she retired in 1990. She was a member of Trinity United Methodist Church, the Trinity Troopers, and the Trinity Friends Group. Many years ago, Mary was involved with the Perkins Band Parent Organization, as well as volunteering for the American Red Cross and the former Good Samaritan Hospital. More recently she volunteered at Care and Share. 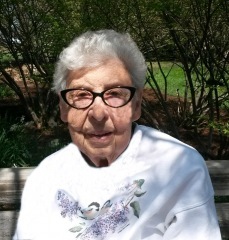 She enjoyed needle work, sewing, reading, gardening, bird watching, and word search puzzles. Mary's most cherished moments were her family gatherings. Most recently she enjoyed time spent with her children in Washington Park near the gazebo where a bench was dedicated to her for her birthday. She is survived by her five children, Robin C. (Chip) Burgess of Cincinnati, Max S. (Karen) Carrier of Mabank, Texas, JoAnn C. (John) Lawrence, Douglas R. Carrier, and Cynthia S. (Craig) Carrier-Vajda all of Sandusky; five grandchildren, Amy G. Burgess, Kristen M. (Ben) Kitzler, Lindsey K. Carrier, Madison L. Carrier, and Meghan C. (John Brandon) Fox; special cousins, Linda Core Kramer, Loren Core, Larry Core, Louise Morvay, and Ken Gratz; close friend and caregiver, Brenda Anderson Sadoski; as well as other relatives and friends. She was preceded in death in 1986 by her husband, Earl L. Carrier, whom she married on August 7, 1954; one stepson, Craig L. Carrier in 1976; her parents, Reno and Vera (Kidd) Gratz; stepmother, Alma (Basinger) Gratz and a very special aunt, Vera Core in 2014. Friends may call Monday, August 13, 2018 from 5:00 PM - 8:00 PM at the Pfeil Funeral Home, Sandusky Chapel, 617 Columbus Avenue, Sandusky and on Tuesday, August 14, 2018 from 10:00 AM until time of funeral service at 11:00 AM at the Trinity United Methodist Church, 214 E. Jefferson Street, Sandusky, OH 44870. The Rev. Don Kuntz will officiate. Burial will be in Meadow Green Memorial Park, Huron. Memorial contributions may be made to the Trinity United Methodist Church, Care and Share of Erie County, P.O. Box 2237, Sandusky, OH 44871-2237, or the Sandusky Library, 114 W. Adams Street, Sandusky, Ohio 44870. The family asks that everyone remember Mary whenever they take a walk, see a cardinal, feel the warmth of the sun, or delight in the beauty of a garden.